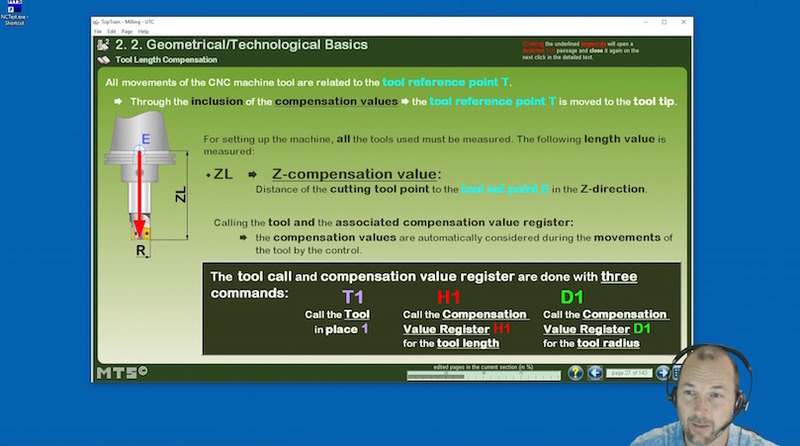 PHOTO: Raymond Mark, Director of Education for Machining Training Solutions, conducts an online High School Honors CNC training course. LONGWOOD, FL – High schools across the country are offering manufacturing training programs, but most don’t have the capability to offer meaningful training in CNC technology. CNC technology is important because it is the manufacturing process of the future and is a critical skill if America is to bring back jobs from overseas. High schools just cannot afford the huge expense for live CNC equipment or the liability associated with training on live CNC equipment. A Florida company has developed an innovative training program that allows high schools to offer their most gifted manufacturing students a CNC program that meets the needs of today’s high tech manufacturing plants. Machining Training Solutions (MTS) in Longwood, FL developed an online Honors Program to train students in CNC technology using virtual simulation that has shown groundbreaking results. The online program, which is instructor led, not only covers CNC technology but provides an introduction to CAD/CAM using a student version of Solid Works 3D CAD Design Software and CAMWorks CNC Manufacturing software. With CAMWorks running inside SolidWorks and making full use of the design information available, students are able to experience the most modern design-though-manufacturing environment available. Providing the course online and after school hours allows students to get this advanced training with no impact on their normal class work. Raymond Mark, a veteran instructor and MTS’ Director of Education, and the team of training specialists at MTS developed the curricula for the 100- hour online Honors Program using a combination of SolidWorks, CAMWorks, MTS virtual simulation software, and MTS Interactive software. Virtual simulation is very engaging for today’s mind set of learning and is revolutionizing the way CNC technology is being taught. Traditional CNC training normally involves a journeyman and an apprentice. It’s a costly one-on-one endeavor that lowers a company’s productivity and puts machinery and the student at risk. With simulation software, Mark can provide students a virtual CNC machine on their desktops where they can test virtual reality boundaries without fear of crashing a machine and destroying the material being produced. It has also been proven that a student’s ability to learn complex CNC processes is dramatically improved with the use of simulation software. Since the MTS Training Center is adjacent to a precision machine shop, Mark was also able to incorporate a shadowing technique into the training to give the online program a hands-on feel. Via a live video feed Mark takes the students out to the manufacturing floor and shadows the actions of a CNC operator, showing them various machining and tooling operations. Students are able to ask questions during the shadowing process. Nicole Gislason, Director of IT at the University of West Florida in Pensacola and a member of the Northwest Florida Manufacturing Council, was instrumental in getting the pilot project implemented in Northwest Florida. The first class was comprised of gifted students from five high schools and a Career Tech Center in Northwest Florida. Over 90% of the students completing the pilot Honors Program passed the test for the IHK-1 CNC Production Specialist certification. The certification is issued by the German Chamber of Commerce and is recognized worldwide as the gold standard for CNC certifications. “This is an advanced technical program. University engineering students could also benefit from this type of training,” Gislason said. While Florida ranks among the nation’s top 10 states for manufacturing and is home to nearly 19,000 manufacturing companies, the solution to the industry’s critical shortage of skilled workers may well be found in the Sunshine State. “Imagine applying for a job and having on your resume that you are IHK-1 certified and have sufficient knowledge in G codes to program a part for a CNC machine? Your chance of getting the job goes up exponentially”, said Richard Winslow, a lifelong manufacturer and MTS consultant. MTS was launched by Manufacturers Association of Florida President Al Stimac, who is also on the board of the National Association of Manufacturers. Stimac spent two years adapting software that was the backbone of the German apprenticeship training to fit what U.S. companies needed. For several years now Florida’s manufacturing sector has benefited from partnerships between CareerSource Florida and postsecondary institutions using MTS Advanced Manufacturing training programs. If you are a high school with an Advanced Manufacturing training program and would like to know more about the MTS online Honors Program for your gifted students, please contact MTS at 407-478-6606 or email info@machiningsolutions.com.